Covenant-making phrases used throughout the Book of Mormon are similar, regardless of which group of people made the covenants. 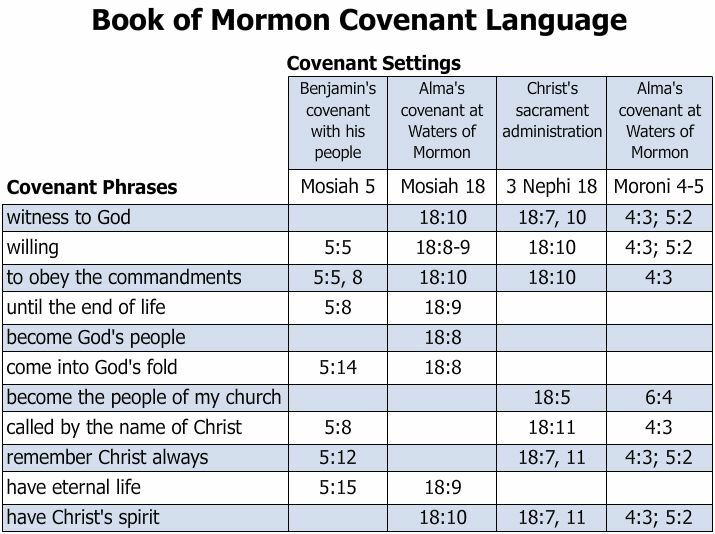 This chart compares covenant-language phrases in four particular settings: after King Benjamin's great speech, with Alma at the Waters of Mormon, during Christ's administration of the sacrament, and during Nephite sacrament administration following Christ's visitation. Most of the elements are the same or are similar throughout, such as the willing commitment to obey God's commandments. Other elements may vary somewhat. For example, the phrase "God's people," used commonly in ancient Israel to emphasize collective salvation, shifts to the phrase "people of [Christ's] church," focusing more on individual membership and worthiness. Covenant language shifted slightly after Christ came to the Americas, when intimate "fold" (shepherd) imagery was replaced by the more institutional affiliation of covenanters with Christ's larger church.